news 07.07.10: It was a perfect day with no clouds, warm temperature, light wind and nice colleagues to climb the Eiger mountain. The way up was icy and it was difficult to reach the BASE jumping exit point called "HEIGER". Once the team finally arrived, it was rewarded with an extraordinary view from the top! 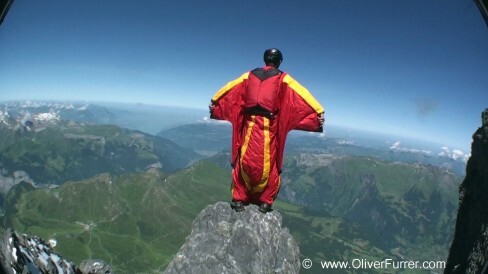 Oliver jumped with his wingsuit and managed to stay in the air for 2 minutes 35 seconds until landing safely at Grindelwald Grund. Evaluation showed that this was Oliver’s longest proximity flight ever.